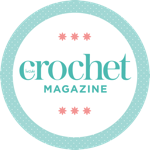 What makes crochet so special compared to other yarn-based crafts is its speed, flexibility and ease of learning. Besides the other obvious option of allowing oneself an enormous yarn stash (guilty! ), what I also love about crochet is just how easily I can create glorious texture. Puff s, bobbles, popcorns or fluff y lace – I love it all! And in crochet it’s often so very simple, too. In this issue, we show you how an addition to a basic stitch pattern either with a carefully placed raised stitch or with a strand of beautiful mohair can make a project pop. I’m wasting no time hooking up Emily Platt’s chunky cardigan – its subtle bobble pattern and soft alpaca is perfect for this in-between-seasons time of year, and to match I will be wearing Theodora Burrow’s gorgeous lacy beret hooked up in one of my favourite hand-dyed yarns, no doubt. For the braver crocheters, the beautiful Be Bold sweater is another favourite of mine, in sheer, soft mohair toughened up with chunky stripes. If you’re just getting started with textural stitches, we have a lovely project by Anique Von Kooij that can be used as a notions pouch or centre stage as a clutch bag, and a light and lacy cardigan crocheted in rustic Garthenor wool by Annelies Baes. Gosh, aren’t we spoilt this month (as per)?! I just want to make it all! So I won’t waste any more time – find your favourite project and get hooking today!